Create your dishes under “Valentine Day” theme. Send presentation of three courses meal (appetizer, main course, and dessert) that you are going to make on this competition. Send the presentation along with registration form in www.mystudyworld.com, no later than 19 January 2018. All participant must be registered as member of My Study World and fill the registration form, which can be downloaded via websites. Please visit and register in www.mystudyworld.com. Upon registering, participants must be recorded as high school students and will represent their school. Each school can send max. 2 teams. Each team consists of 3 students. Competition registration opened from 9th October 2017, and will be closed on 19th January 2018. WEFEST team will come to schools of 5 chosen finalist to do some interviews and event coverage. The interviews will take place during February 22nd – 26th 2018. 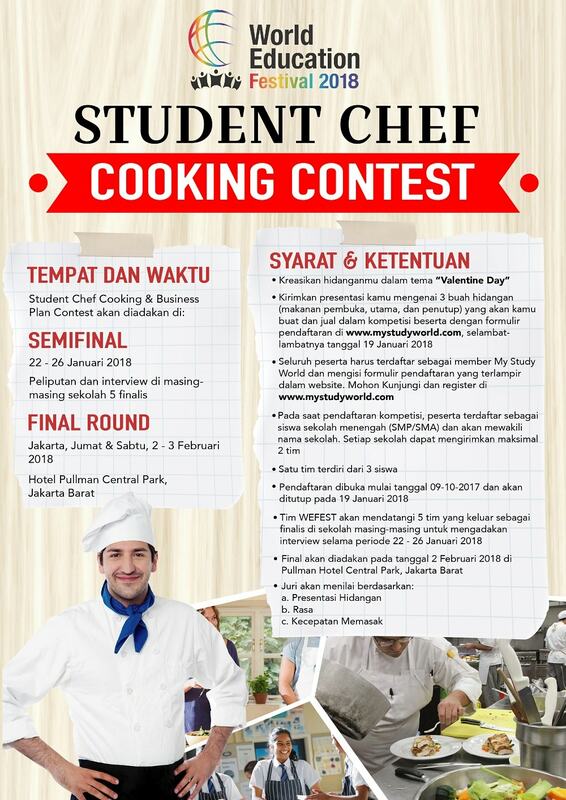 The final will be held on February 2nd 2018 at Pullman Hotel Central Park, West Jakarta. Copyrights © 2017 All Rights Reserved by WEEINDONESIA.